We're just a day off as his birthday is November 10. This man is one year younger than me and has accomplished so much in his lifetime. He is multifaceted writer. My introduction to him was his book The Graveyard Book a couple years ago. Front Flap: "Nobody Owens, known to his friends as Bod, is a normal boy. 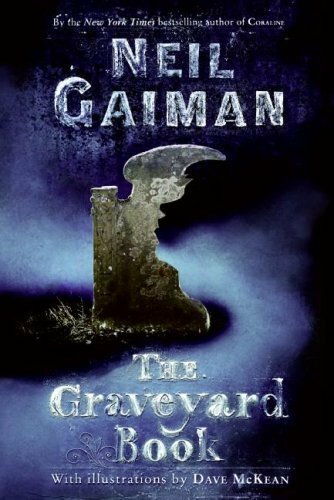 He would be completely normal if he didn't live in a sprawling graveyard, being raised and educated by ghosts, with a solitary guardian who belongs to neither the world of the living nor the dead. There are dangers and adventures in the graveyard for a boy--an ancient Indigo Man beneath the hill, a gateway to a desert leading to an abandoned city of ghouls, the strange and terrible menace of the sleer. But if Bod leaves the graveyard, then he will come under attack from the man Jack--who has already killed bod's family...."
"The knife had a handle of polished black bone, and a blade finer and sharper than any razor. If it sliced you, you might not even know you had been cut, not immediately. Bod wanders up and into a graveyard where the ghosts and other denizens of the place decide to protect him. Of course, they have to put it to a vote first. Bod is raised by the ghosts and Silas, who neither dead or alive, protects him and makes sure his physical needs for food and dress are taken care of. Bod gets an interesting education in history and thought from various ghosts from the different eras as well as lessons in slipping through shadow and fading from awareness, "the ways of the dead". "Bod tried again. He closed his eyes and imagined himself fading into the stained stonework of the mausoleum wall, becoming a shadow on the night and nothing more. He sneezed. "Dreadful", said Mr. Pennyworth, with a sigh. "Quite dreadful. I believe I shall have a word with your guardian about this." He shook his head. "So, the humors. List them." "Um, Sanguine, Choleric, Phlegmatic, And the other one. Um, Melancholic, I think." Throughout the story, Jack never ceases to look for Bod and finish the job he started. The villains (the Jacks of all Trades) reasons in the story for killing bod's family and him are a bit vague and I'll leave the mystery of what happened to your imaginations. 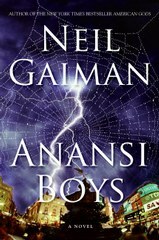 I thoroughly enjoyed The Graveyard Book and recently read Anansi Boys which was well written and just as unique as the other book. 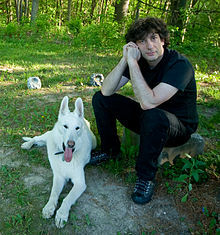 Neil Gaiman. His books are intriguing, imaginative and entertaining. In honor of his birthday, check out one of his books this month. A little behind with posting, but I think I'm doing ok with reading! Glad to hear it. Keep going! Happy to hear it. My plan is to read more of his books next year. grrr.... #19 should have read "Gina (Perfect Bait)"